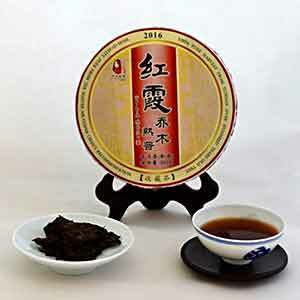 After his very impressive Chang-an Ripe Pu-erh, Master Vesper Chan has come out with another great product. 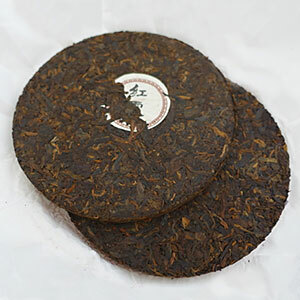 Red Sunset Ripe Pu-erh is produced with spring leaves from large arbor trees in the Bulang Mountain. After undergoing fermentation, this tea was aged in Master Chan’s warehouse in Menghai for two years in order for the tea to settle before pressing into cakes. I tasted this tea for the first time in Master Chan’s tea shop in Beijing. I was impressed by how flavorful and rich this tea was. After the two year “resting” period, the initial pungency of the freshly fermented tea has been replaced with a thick, smooth, and clean texture that leaves a pleasant sweetness in your mouth and throat. This tea is comprised of two compressed cakes of 200g (7 oz.) each. Use 5-6g of leaves per 6 ounces of water. Rinse the leaves twice with boiling water (212 degree F) and discard the water. Start steeping according to the recommended steeping time below.